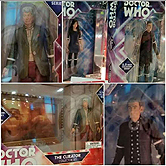 Underground Toys yesterday announced an extensive in-store promotion at US retailer Hastings Entertainment for Doctor Who merchandise starting in October and running through the holiday season. 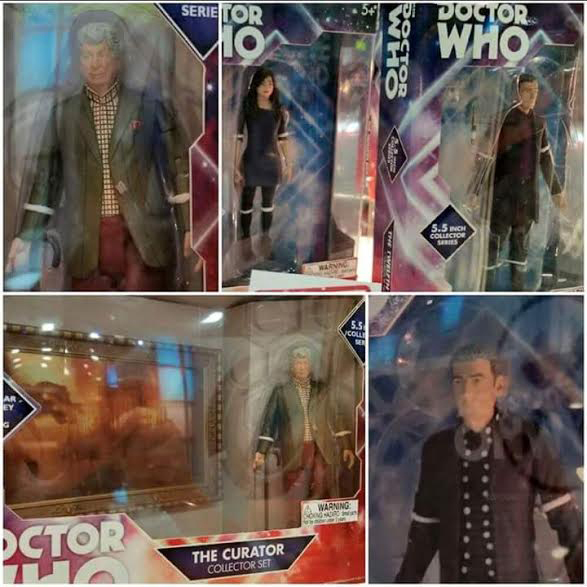 The campaign, in association with BBC Worldwide, will feature a 6 x 4 ft display unit bringing together key merchandise from the show alongside other retail activity. 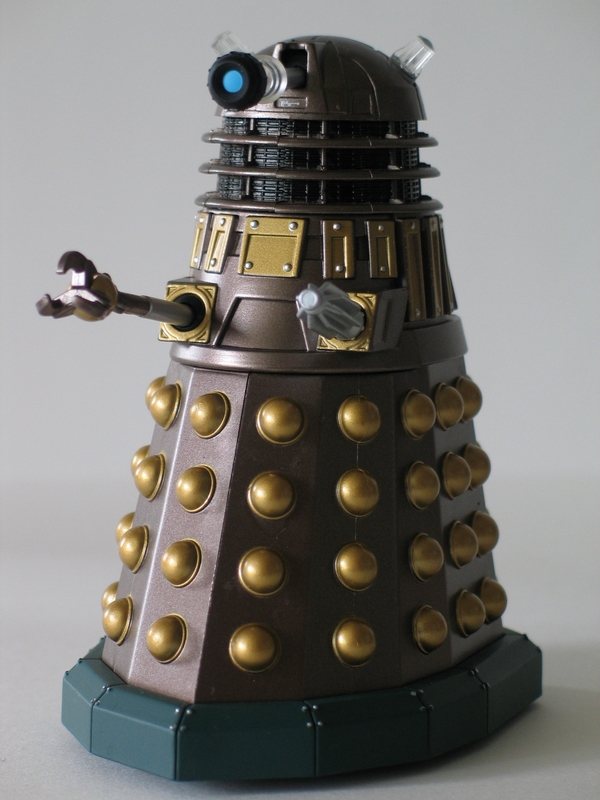 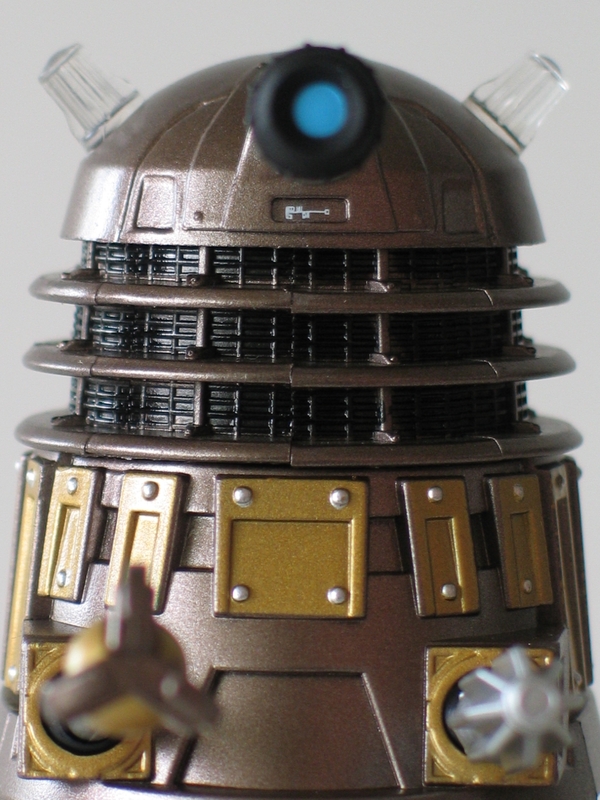 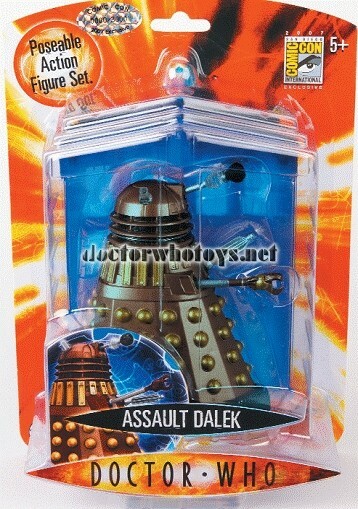 In addition, Hastings will be selling an exclusive Yellow Dalek Action Figure, only available at Hastings in North America. 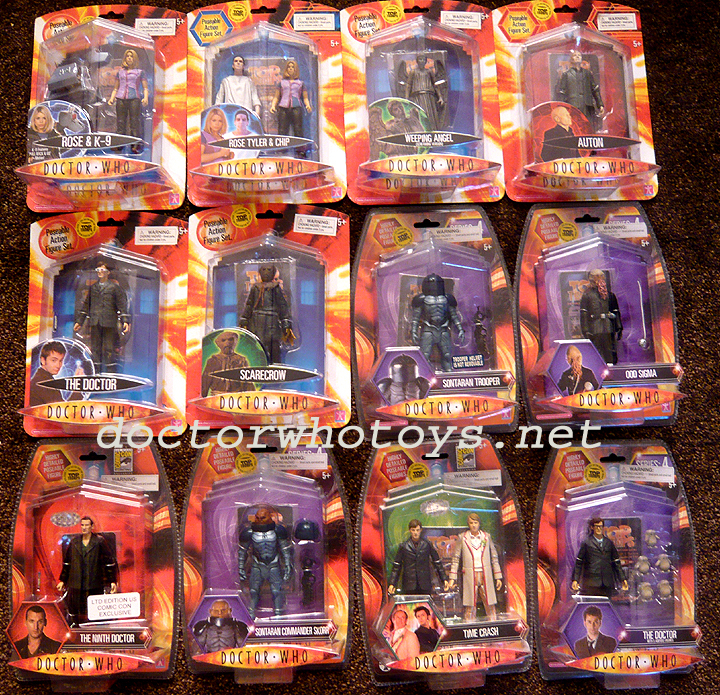 2010 SDCC exclusives from Underground Toys. 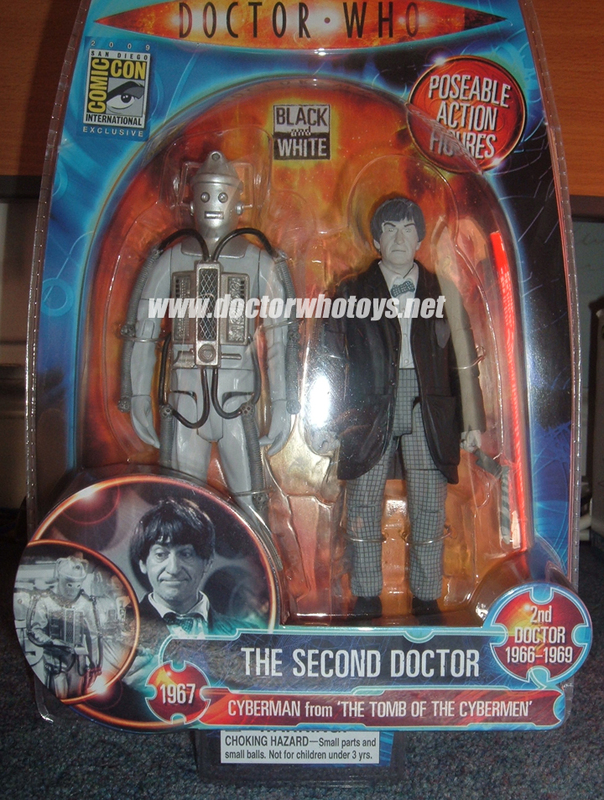 Available at the San Diego Convention Center July 22-25. 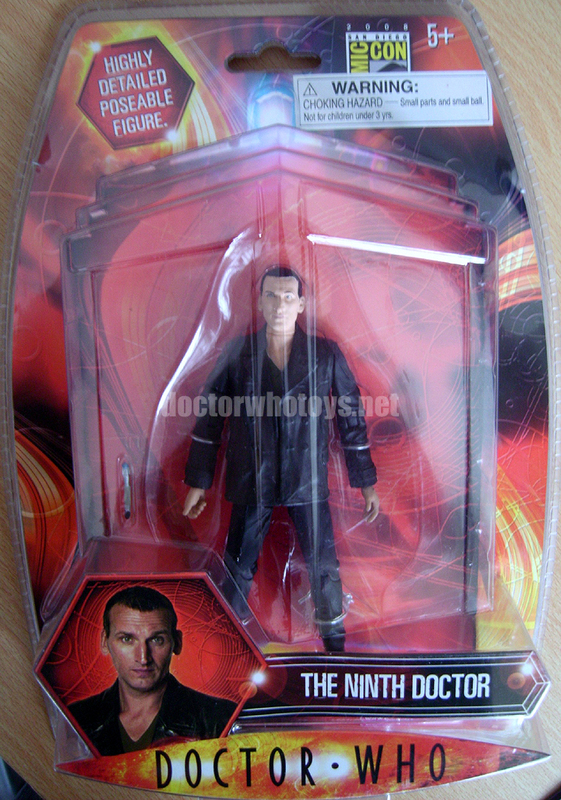 Ninth Doctor Christopher Eccleston as seen in 'Father's Day' (2005). 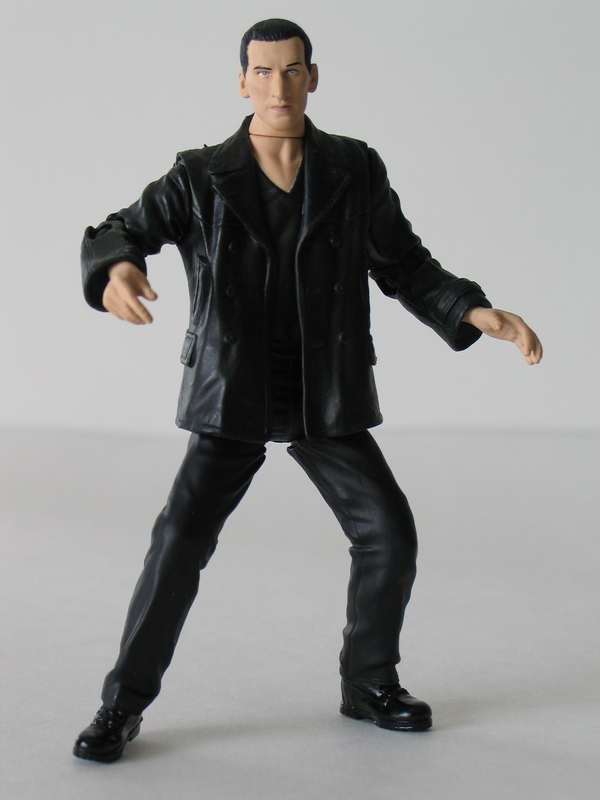 This figure has full articulation. 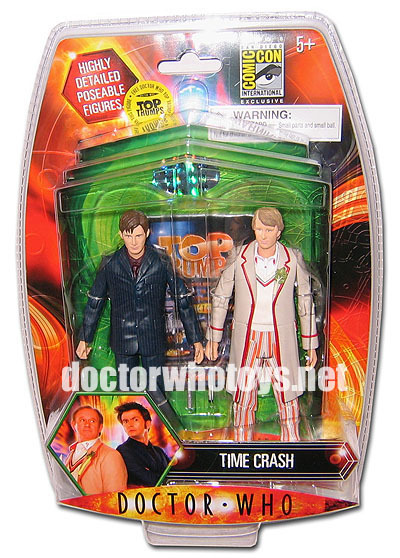 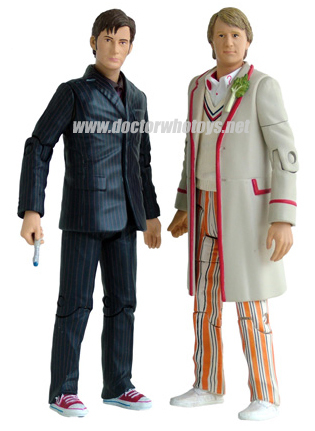 Featuring an exclusive Fifth Doctor Peter Davison figure and Tenth Doctor David Tennant pairing seen in 'Time Crash' (2007) the shortened Children in Need episode. 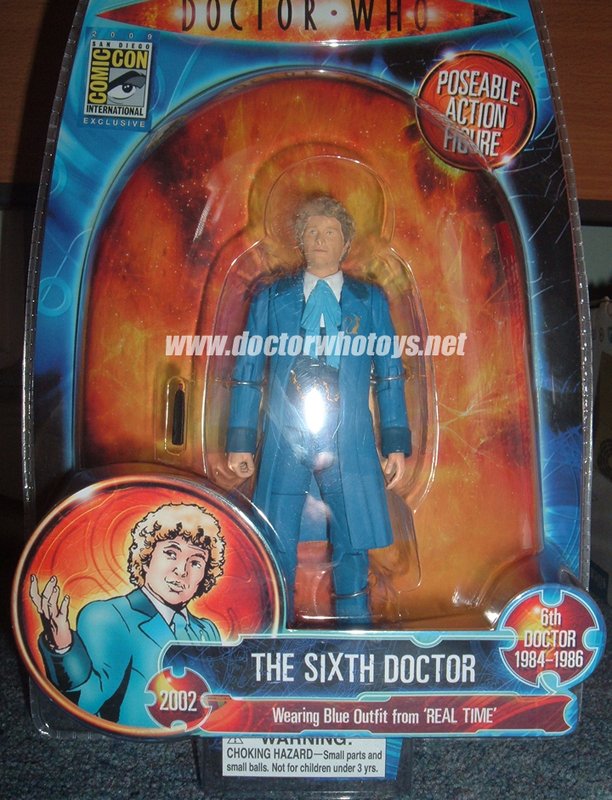 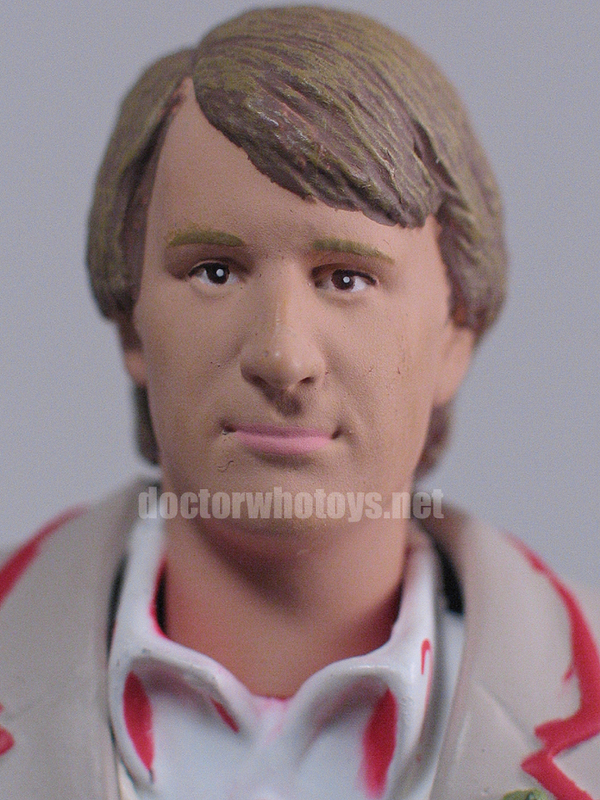 The 5th Doctor figure with celery stork is exclusive to this twin pack. 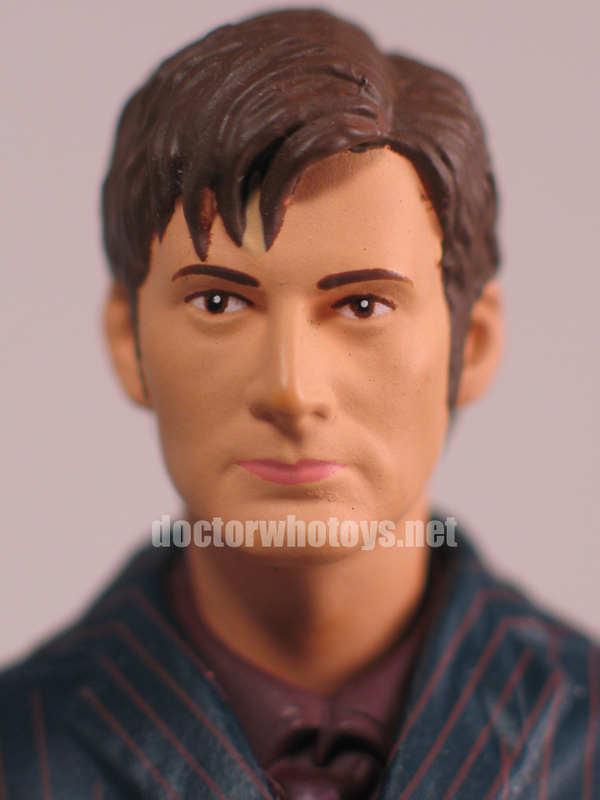 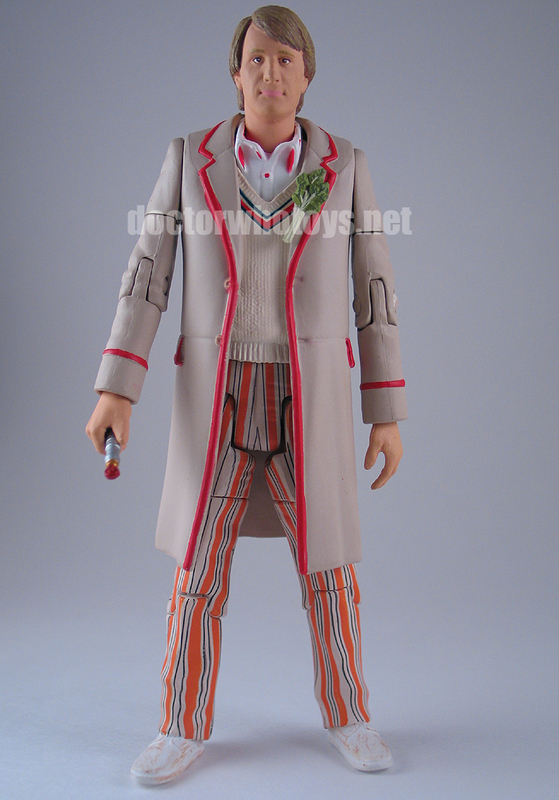 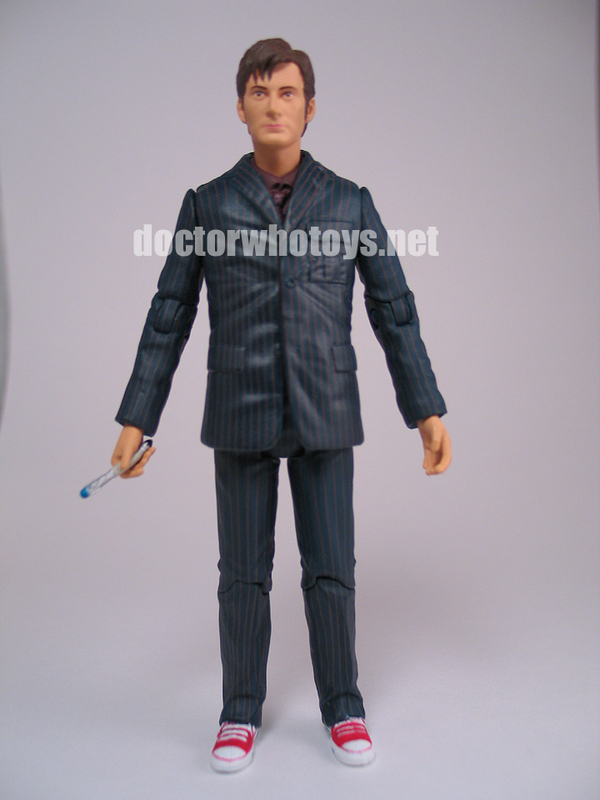 The 10th Doctor is a previously released sculpt in blue suit and red converse with a new burgundy shirt. 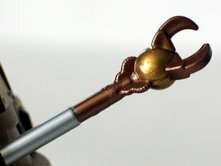 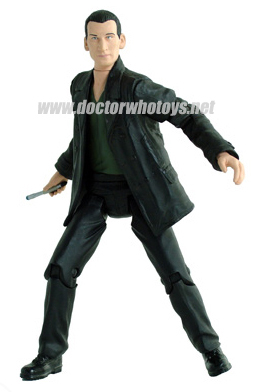 Underground Toys will be distributing the Torchwood Action Figures: "Underground will be bringing the first wave of Torchwood action figures stateside sometime in the Fall and will also be producing our own raft of products for the UK and USA to include, 'In Your Pocket' voice keychain, housewares and perhaps a few surprises". 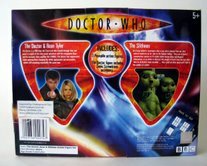 Voyage of the Damned Set will be released in July 2008 in the US. 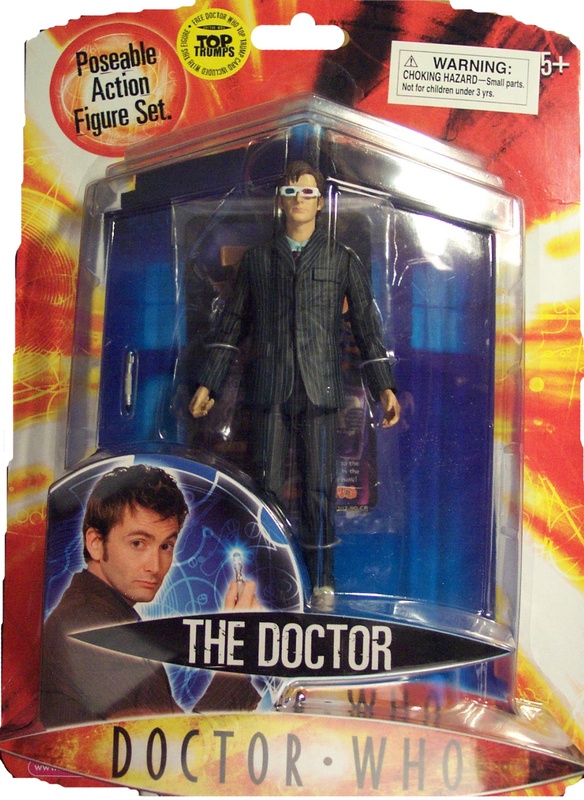 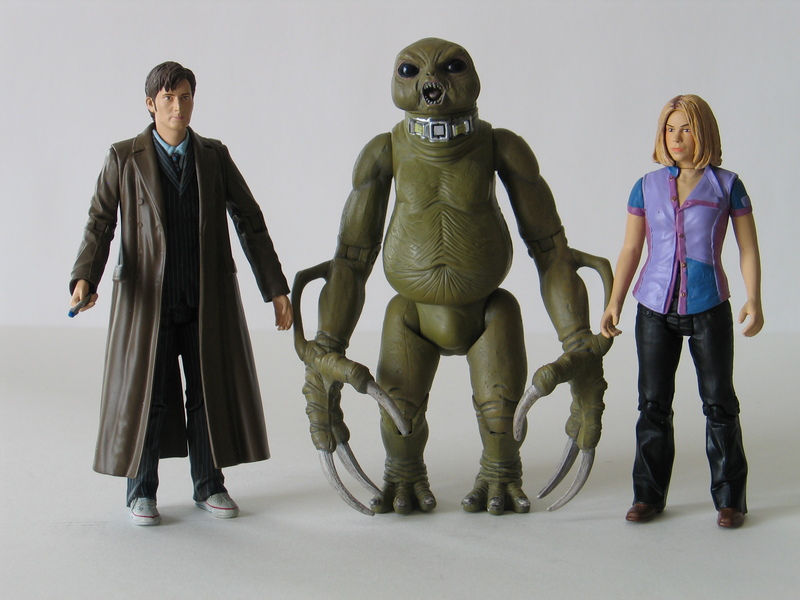 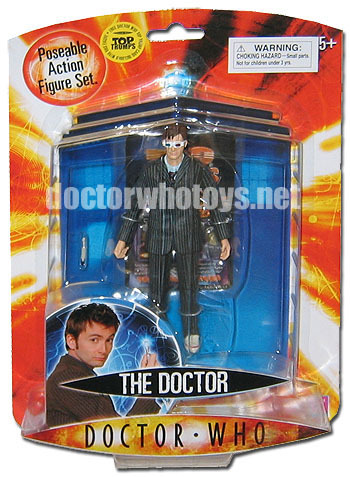 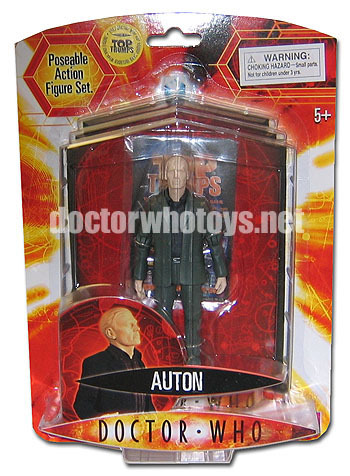 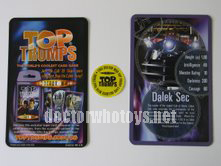 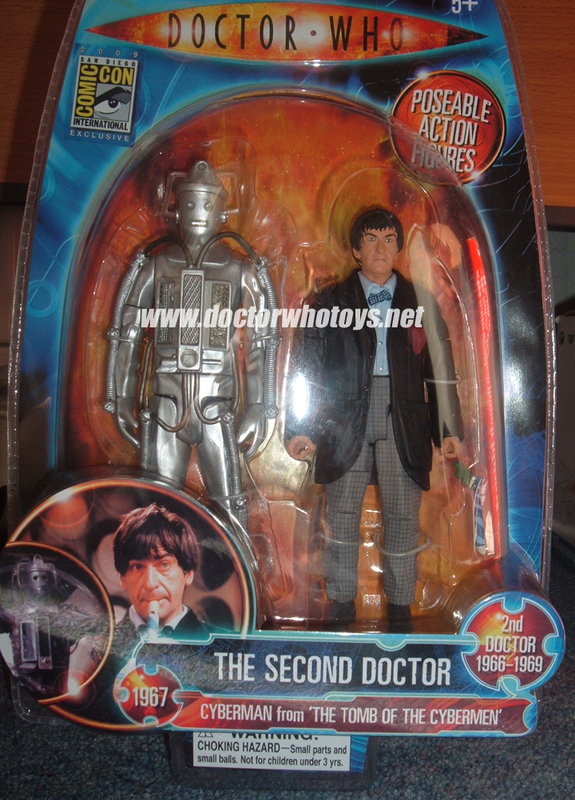 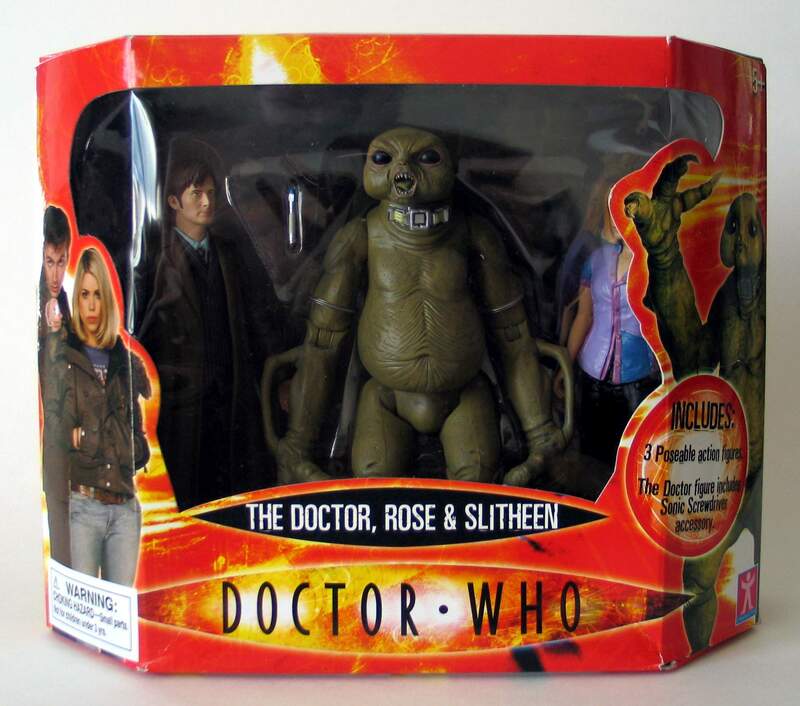 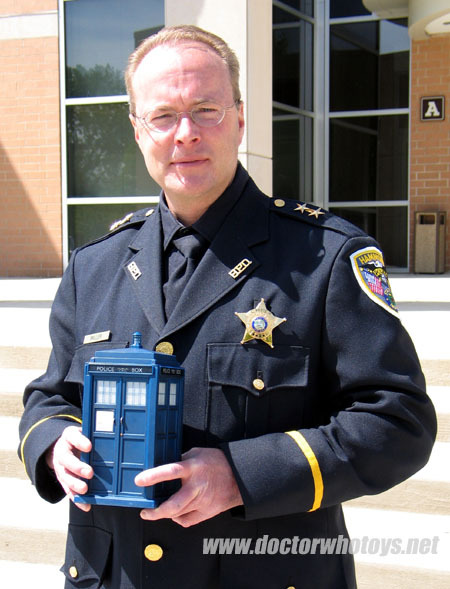 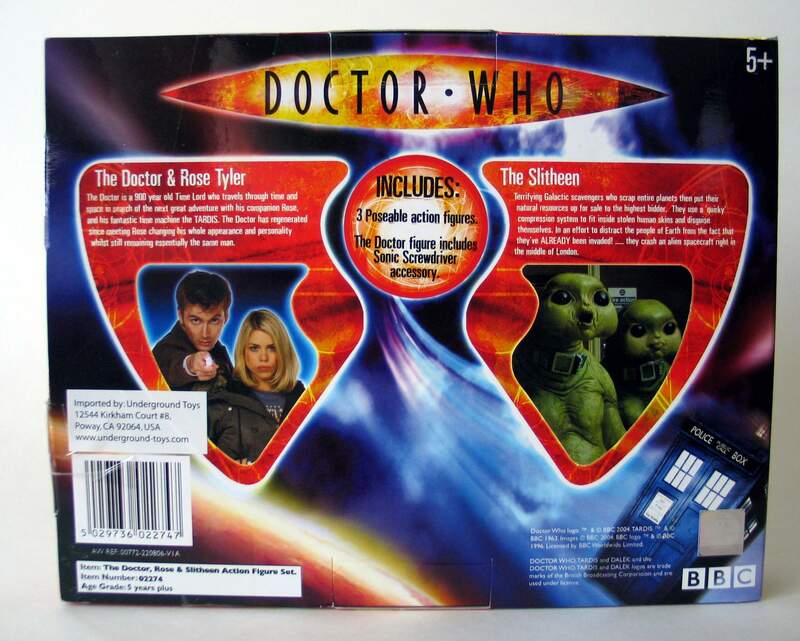 In 2007 Underground Toys began releasing many exclusive new US only Doctor Who toys and action figures. 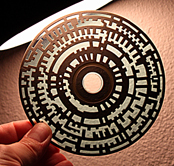 Many more are planned. 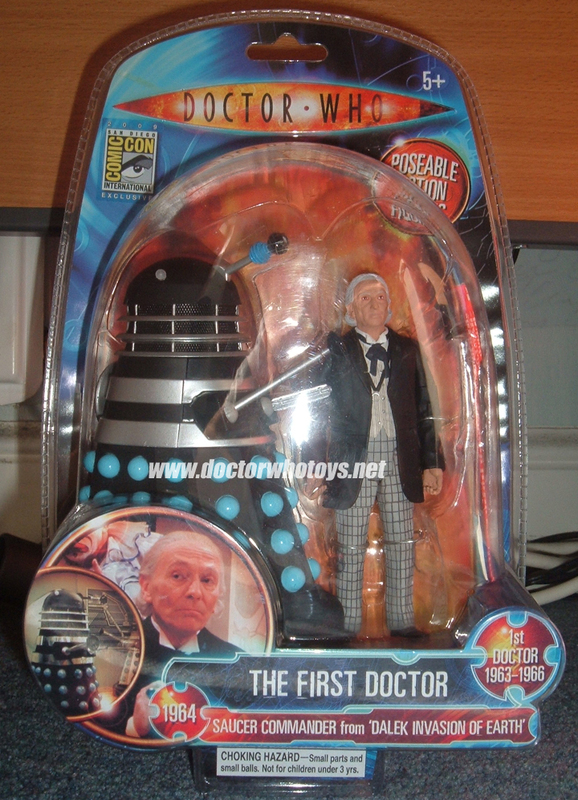 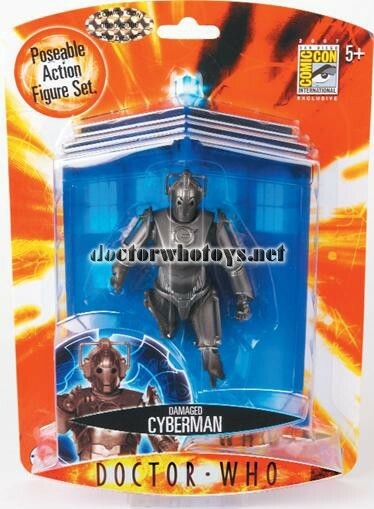 In July 2007 Underground Toys showcased the Doctor Who toy line at the world's largest gathering of entertainment fans - the San Diego Comic Con (July 26 - 29) with two exclusive action figures. 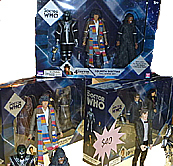 For the first time EVER there were two exclusive Underground Toys Doctor Who action figures available for fans to buy at the show. 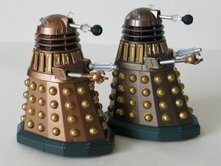 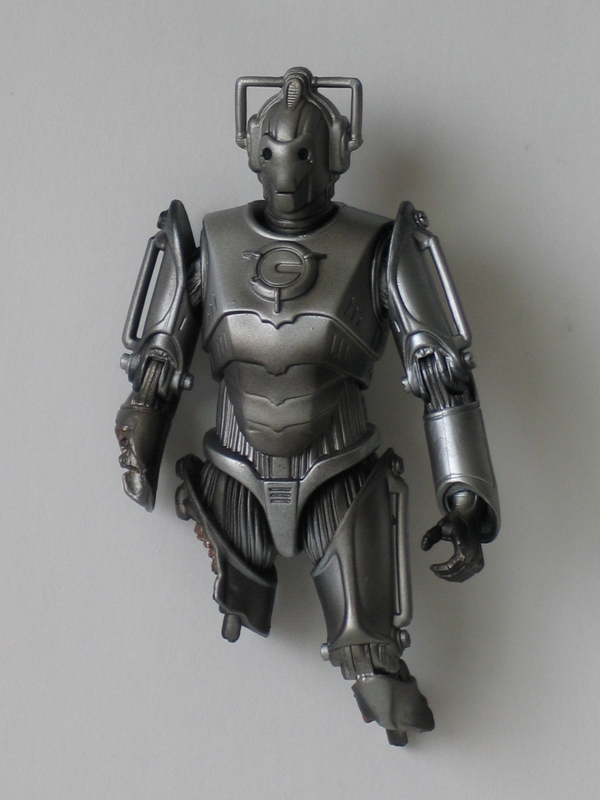 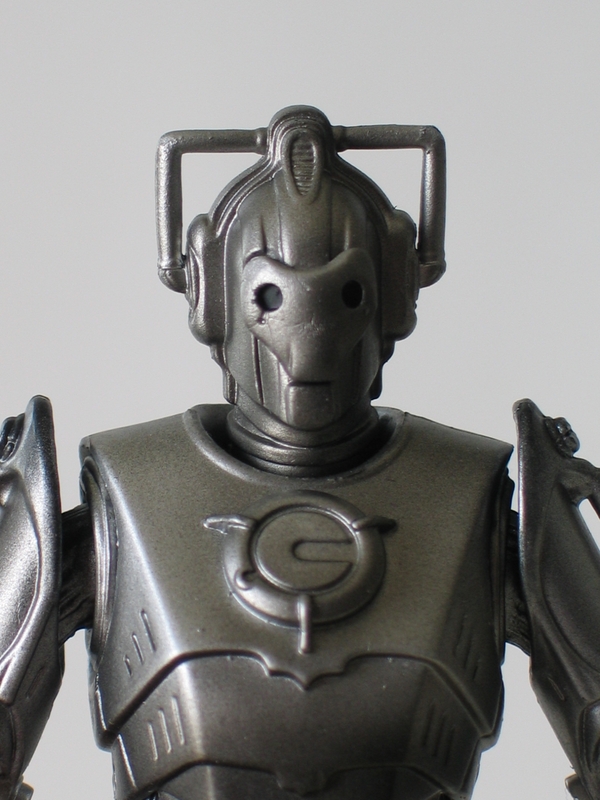 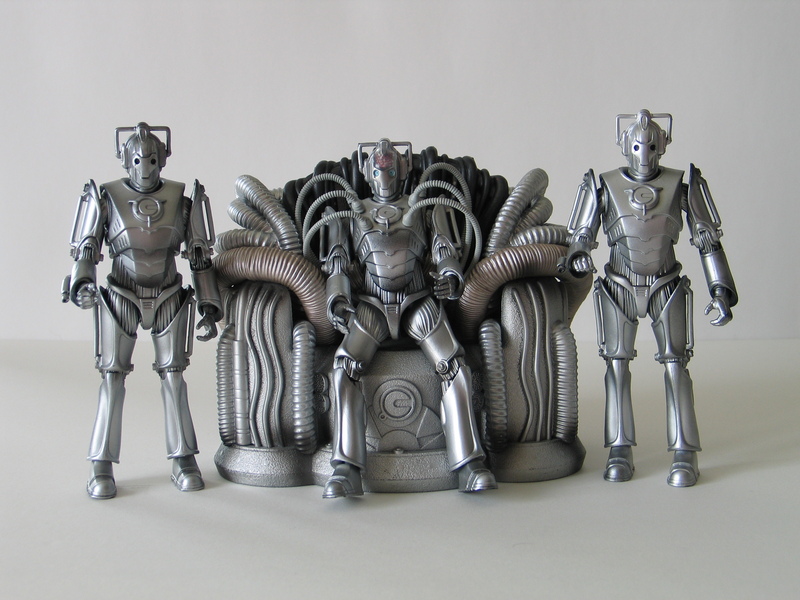 The 5" Battle Damaged Cyberman and 5" Chocolate Assault Dalek figures were specially commissioned. 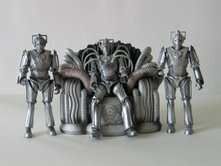 Only 3,000 of each have been produced specifically for the San Diego Comic Con. 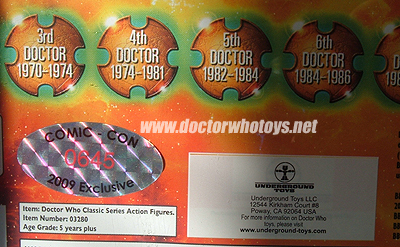 Each figure is individually numbered. 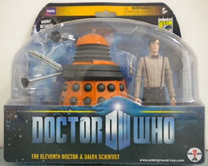 The carded packs include the unique SDCC 2007 logo. 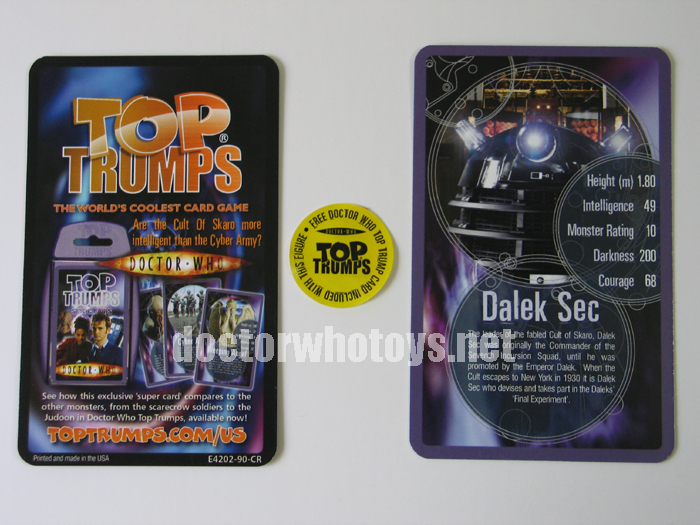 The 9th Doctor is available now in the USA on the exclusive new American release card back with no Series branding. 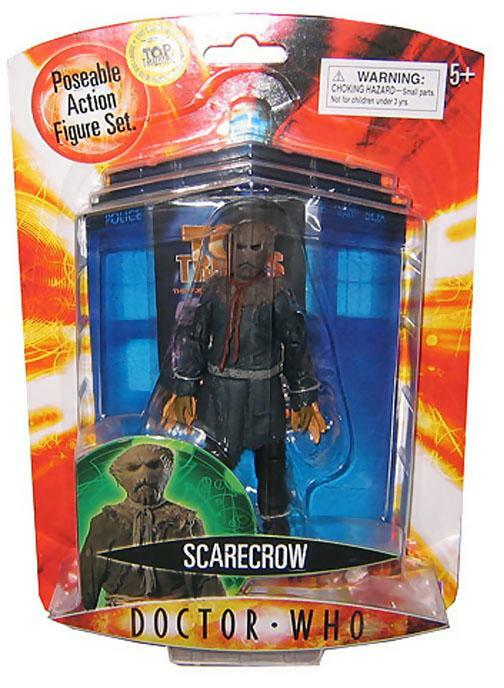 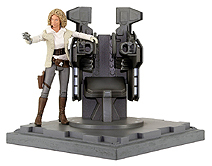 This figure has been released in America as part of the US exclusive 5 figure wave featuring the Moxx of Balhoon, Cassandra, Dalek with Mutant Reveal and Sycorax Leader all with new US cardbacks. 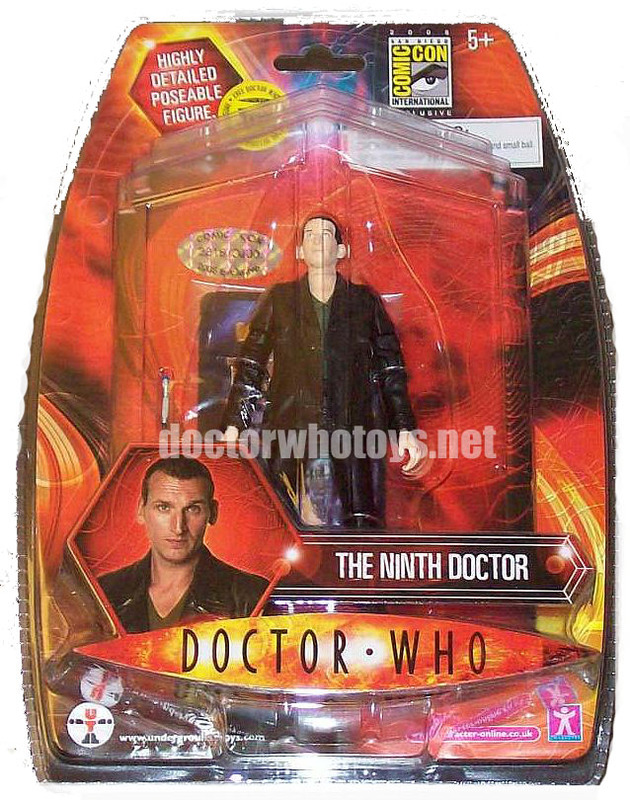 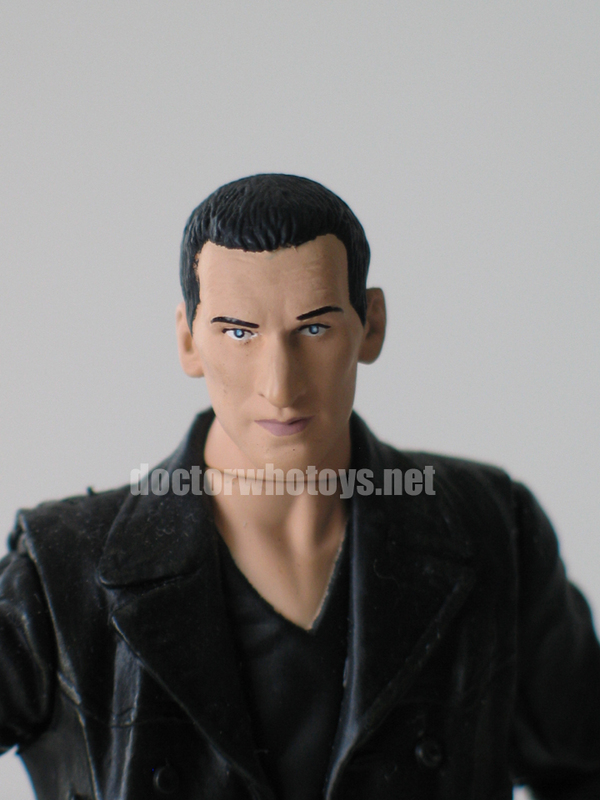 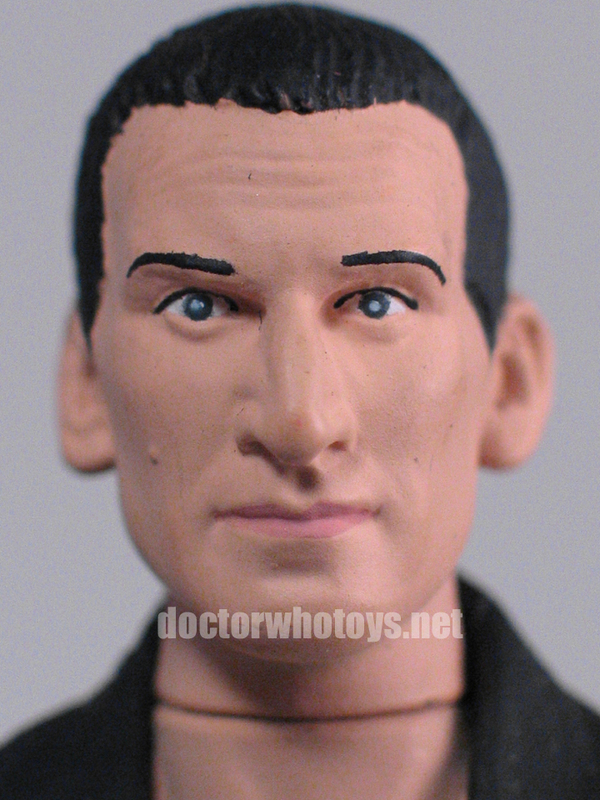 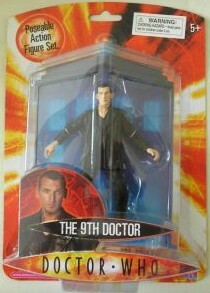 The Christopher Eccleston 9th Doctor figure has been released in the UK too, but branded as Series 1. 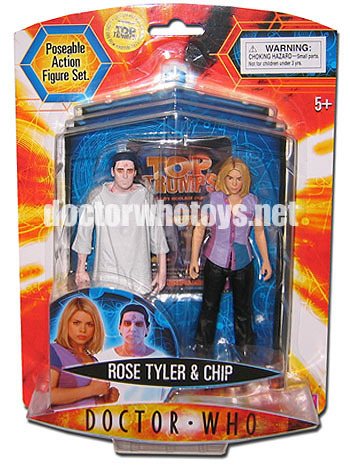 September 2007 sees the US release of a 300 piece limited edition 'Newbury Comics Exclusive Action Figure Gift Pack'. 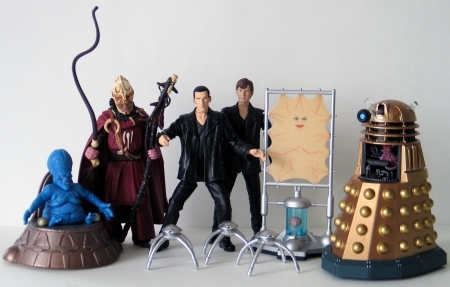 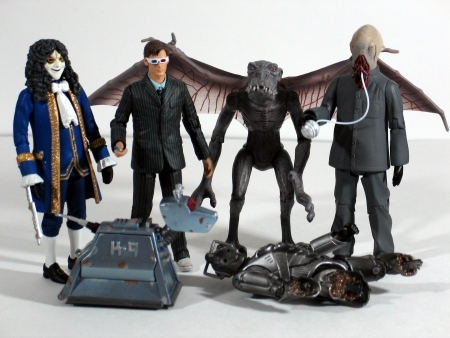 The set features Blue Clockwork Man, The Doctor with 3D Glasses, Rusty K9 (pull-back motion), Ood Worker, Damaged Cyberman and Grey Krillitane. 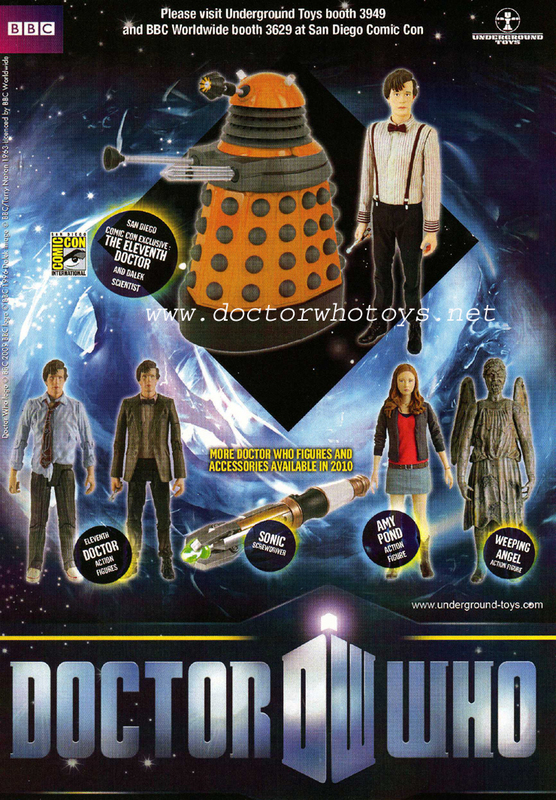 The lighter blue Clockwork Man's waistcoat appears in the promotional photograph only and does not feature on the figure that is included in the set.